Abe Cohen Plumbing and Heating Inc. is who you need to call for frozen pipe thawing in commercial buildings in Ahuntsic, Baie D'Urfe, Beaconsfield, Bord du Lac, Cote Saint-Luc, Cote St-Luc, Dollard des Ormeaux, Dorval, Downtown, Hampstead, Ile Bizard, Lachine, Lacey Green, Lakeshore, LaSalle, Laval, Mile End, Montreal West, NDG, Nouveaux St. Laurent, Nun's Island, Old Montreal, Outremont, Pierrefonds, Plateau, Pointe Claire, Pointe St. Charles, Roxboro, Ste-Genevieve, St. Henri, Town of Mount Royal, Verdun, Ville St. Laurent, West Island, Westpark, Westmount. If you suspect that a water line or meter is frozen, call us promptly. A frozen pipe should be thawed as soon as possible, and under controlled conditions to prevent leaking and damage to your property. A common misconception is that a water pipe will leak when it freezes and bursts. A pipe will often burst when frozen, but the leak generally occurs when the pipe thaws. If a frozen pipe in an inaccessible spot bursts, serious property damage can be caused in a very short time. This is why it is safer that the pipe be defrosted under controlled conditions. While waiting for us to arrive, close the water supply to the frozen pipe(s) or to the whole building. Pipes typically freeze in extremely cold weather. The most susceptible pipes are exposed, or in an area that is not well heated. A frozen meter or pipe feels very cold to the touch. If no water runs anywhere in the building, the cause can be a frozen meter or pipe from the city's water main. If water flow is off in only part(s) of the building, then it is most likely that a pipe inside the building is frozen. As cold weather approaches the Montreal area, drain all outdoor water lines and hoses, "summer plumbing", and uninsulated pipes. Close shut-off valves to pipes and faucets that lead to the outdoors. With the interior valve closed, leave outdoor faucets open to drain. Apply enough heat to prevent freezing in all areas of the building with water pipes. Wrap pipes with electric pipe-heating cable in areas that are difficult to heat. Heating a water pipe costs far less than heating a room or building. Water that is flowing will not freeze. 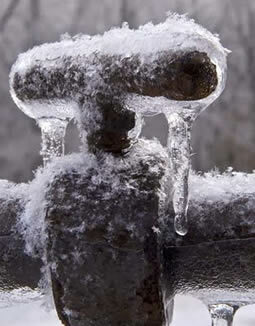 As a last resort on very cold nights for pipes that are known to freeze, leave a tap (fed by that pipe) dripping. Once we have thawed your frozen pipes, allow us to offer you solutions to prevent a recurrence. At Abe Cohen Plumbing and Heating Inc., we are a three-generation family business with more than 50 years in the plumbing trade. We consider our customers to be family and friends in a long-term relationship with us. We have the experience, expertise, tools, and equipment to thaw frozen pipes in the greater Montreal area. We are respectful, clean, and professional. We are certified and active members of CMMTQ (Corporation des maîtres mécaniciens en tuyauterie du Québec), ACQ (Association de la Construction du Québec), and certified partners of Gaz Métro for natural gas piping and installations.